One of the value-adds of doing business with the ALL Family of Companies is that it employs its own fleet of 2,500 trucks and trailers to transport cranes throughout North America. This gives customers a critical edge in staying on schedule – in a business where time means big money – without having to rely on outside trucking companies. Now ALL Crane is bolstering that capability with acquisition of a massive haul of 212 new trucks and trailers. It is a significant purchase that broadens the company’s ability to offer complete door-to-door crane service. The order includes 40 Peterbilt trucks, 12 Nelson RGN (removable gooseneck) trailers, and 160 Manac drop deck trailers. Of the Manac trailers, 100 are 48’ (14.6 m) spread axle units, which can accommodate 9,000 kg per axle. 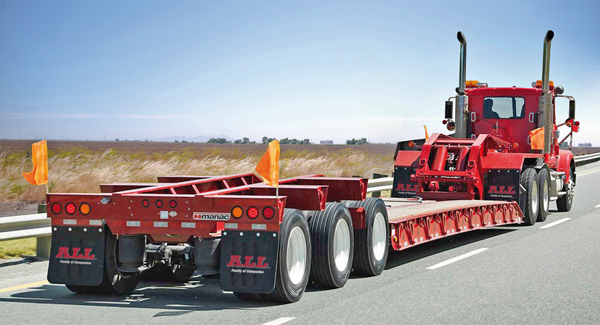 The remainder consists of 50 tandem axles, 4 quad axles, and 6 aluminum flatbeds. The majority of the Manac trailers are galvanized, continuing ALL Crane’s investment in galvanizing rather than paint, which can extend trailer life at least twofold. Galvanized steel decks reduce maintenance and resist chips, scratches, and wear, particularly the corrosion caused by road salt and brine. Also, although ALL Crane is a Manac dealer, these 160 new trailers will be exclusively dedicated to the company’s own fleet. ALL Crane will take delivery of the entire order through the end of 2019, with units being strategically distributed across all branches of the ALL Family. ALL Crane’s specialized transport divisions have ICC authority in the 48 contiguous U.S. states and throughout Canada. As a founding member of SC&RA, the Specialized Carriers & Rigging Association, ALL has the capability, equipment, knowledge, and expertise to move equipment safely, efficiently, and on time.